Spice Brasserie – Yuletide Buffet With Epic Roasts, Crustaceans, Oysters & More! 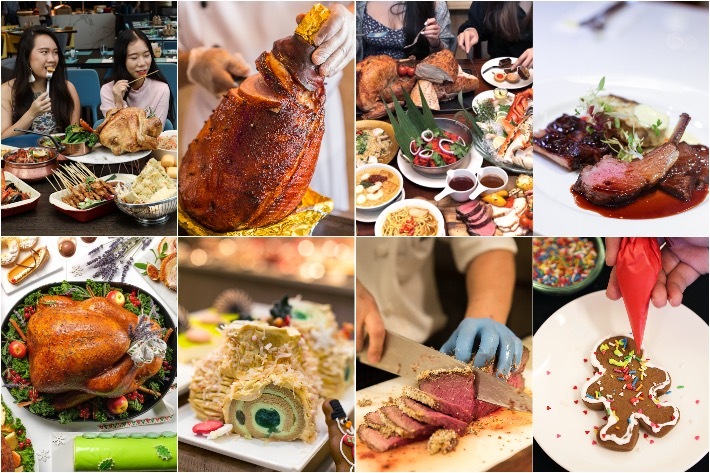 Promising a seasonal spread of festive meats and treats along with a bevvy of authentic local and Asian delights thrown into the mix, Spice Brasserie at PARKROYAL on Kitchener Road ranks high as one of our top venues of choice to indulge in a full-on feast this festive holiday. Pulling out all the stops and ready to tantalise the senses (especially our taste buds) on all fronts, the culinary team behind Spice Brasserie impresses with their selection of colossal roasts featuring the likes of the all-new Peranakan-Style Roasted Spice Cured Turkey that wowed us with its succulent meat and its heady aroma of Nonya spices. As far as drool-inducing food goes, they’ve nailed down their various festive roast meat offerings, but if you’re pining for something to satiate your sweet tooth, then you will not be disappointed with their Sea Salt Caramel Log Cake. But seasonal dishes aside, be sure to tuck into their various Asian and international items as well, not forgetting their selection of crab dishes—a mainstay and what Spice Brasserie is classically known for. This festive feast will be going on from 17 December 2018 to 1 January 2019 and diners can quote ‘ladyironchef’ upon making reservations to enjoy 20% off both the lunch and dinner festive buffets.